Jena Irene Asciutto also known as Jena Irene (born July 13, 1996) is an American singer from Farmington Hills, Michigan. She was the runner-up of the thirteenth season of American Idol. Asciutto became the first female Wild Card contestant of the series to qualify into the finale, and became the second Wild Card contestant, after Clay Aiken in the second season, to make it into the finale. In April 2015 she signed a long-term recording deal with the independent Detroit label Original 1265 Recordings. Asciutto released her debut EP, Innocence, on April 22, 2016. Jena Irene Asciutto was born in Farmington Hills, Michigan, on July 13, 1996 to George Asciutto and Julie (née Loiselle.) She graduated from North Farmington High School on June 8, 2014. She participated in North Farmington's annual "Coffee House" talent show, and from ages 12–16 was a member of a band called Infinity Hour, before it disbanded in February 2013, prior to her American Idol audition. 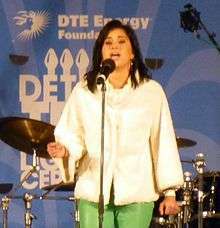 While on American Idol, she performed under the shortened name of Jena Irene. For her American Idol audition, Asciutto sang "Rolling in the Deep" by Adele. During the audition process, production continually called her "Jena Irene," possibly due to a mistake she made when writing down her name, as "Irene" is not her surname, but rather her middle name. Although she initially made attempts to correct her name, she eventually decided to keep the name professionally. During the group round, she sang "Too Close" by Alex Clare, alongside Sikenya Thomson, Allie Odom, and Mufarid Zaidi. She made it into the third part of Hollywood week by singing an original song called "Unbreakable Me," which has since been released on iTunes. Asciutto performed the song again during her hometown visit after making it to the top 3. She was announced as the runner-up on May 21, 2014. Hollywood Round, Part 2 Group Performance "Too Close"
Top 8 Back to the Start Duet "Just Give Me a Reason"
Top 7 Competitors' Choice Duet "Gimme Shelter"
Top 5 America's Requests Trio "Best Day of My Life"
Asciutto took part in the American Idols LIVE! Tour 2014 from June 24 through August 24, 2014. She began work on her debut album immediately after the show as well. In April 2015, Asciutto signed a record deal with Detroit-based label Original 1265 Records. In October 2015, the music video for "Unbreakable" was released. The single would later be on both debut EP, Innocence, which was released on April 22, 2016, and her upcoming album, Cold Fame, which will be released in late 2016. The music video for the second single, "Innocence", was released on April 20, 2016. On April 22, 2016, "You Gotta Help Me", was featured in the Billboard.com Editors' Picks. ↑ Sue White (February 22, 2014). "'American Idol' finalist Jena Irene Asciutto has strong Bay City ties". MLive.com. ↑ Shari (21 May 2014). "American Idol Jena Irene Sings 'Ain't It Fun' with Paramour 5/21/14 – #Idolfinale". Have U Heard. Retrieved 24 May 2014. ↑ "Who Is Jena Irene Asciutto? American Idol 2014 Contestant Background Info". Retrieved 16 June 2014. ↑ Perlman, Jake. "'Idol' Exit Interview: Runner-up Jena Irene on her name change, why she won't perform at prom -- VIDEO". Entertainment Weekly. Retrieved 14 June 2014. ↑ "Blog". Jena Irene. Retrieved 2015-11-03. ↑ "Jena Irene Asciutto (@JenaAsciutto1) | Twitter". twitter.com. Retrieved 2016-01-31. ↑ "See what 'American Idol' runner-up Jena Irene Asciutto is up to now". MLive.com. Retrieved 2016-02-02.